El Coto Crianza, a very good, well-balanced and flavorful ruby red wine, is an exception. The Crianza is made from 100 percent Tempranillo, the dominant grape in the Rioja region, and the wine is widely available and often on sale for less than $10. Founded in 1970, El Coto de Rioja comprises 12 independent wineries, which produce highly-rated wines ranging in price from $14 to $50. 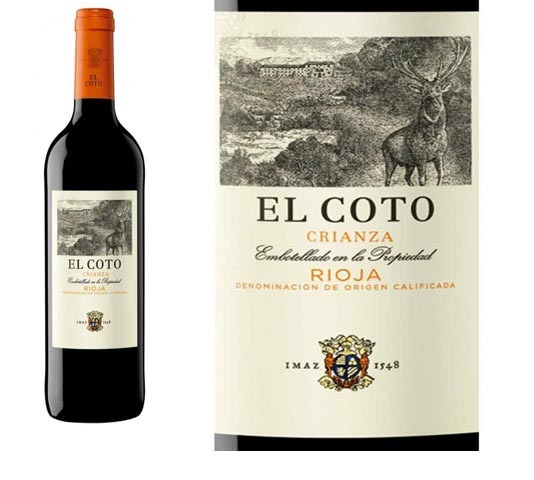 Bottles of El Coto, which means “the preserve,” sport a handsome label with an etching of a large buck and other deer with a manor house in the background. The hallmark of wines from Rioja, Spain’s top wine region, is oak-barrel aging, which is decreed by labeling laws and is almost a moral imperative for Spanish winemakers, Karen MacNeil writes in The Wine Bible. Since the 11th century, the region of northern Spain and its wines have been known as Rioja. Although there are other theories about the origin, the name probably came from the Rio Oja, a tributary of the Ebro River that flows through the heart of the region’s wine country, MacNeil writes. Wine has been made in Rioja since before the Romans, but production has waxed and waned throughout its history, interrupted for long periods by wars, occupations, pestilence and starvation. In the early years, wine was made mostly by the monks in monasteries. Archeological discoveries show winemaking flourished between 200 B.C. and the sixth century A.D., but production slowed for almost 700 years when the Arabs were running things. Rioja wines were prominent throughout Europe, and sales were booming for about five centuries after the Muslim rulers were kicked out. When mildew and the phylloxera mite destroyed the Bordeaux wine industry in the late 1800s, Rioja prospered. French winemakers came to Rioja, where the vines were healthy, and purchased wine and set up wineries. They also introduced oak aging to the Spanish region. Rioja became the first designated wine district in Spain in 1932, but the country wasn’t a great place to live or grow grapes during first half of the 20th century, and things didn’t settle down for wine producers until the 1970s ushered in some stability and modern winemaking techniques. Until then, the industry had been diminished by phylloxera, decimated by World War I, the Spanish Revolution and World War II and destroyed by governmental orders to rip out vines and plant wheat to feed a starving population. A group of winemakers committed to creating a new type of Rioja wine founded El Coto in the town of Oyon. Its first wines were released for sale in 1975. El Coto is not only well-respected for its wines, but also for being one of Spain’s largest wineries, producing 1 million cases of Crianza alone for worldwide distribution, the El Coto website says. Under Rioja wine district regulations, bottle labels must reflect how long the wine is aged. For example, less expensive young wine, aged a few months or a year, mostly in stainless steel vats, is labeled simply Rioja with the vintage year. Wines labeled Crianza age for two years with at least one in oak barrels, and Reserva wines age for three years with at least one year in oak. The ultimate Rioja wines, labeled Gran Reserva, are made from grapes grown in the best years, from the best estates and aged a minimum of five years with at least two years in oak barrels. El Coto Crianza is made from grapes from low-yielding vines grown sustainably on estate vineyards throughout Rioja. The wine is fermented in stainless steel vats for 20 to 25 days on the skins to extract flavor, followed by 12 months in a combination of new and used American oak barrels and six months in the bottle before being released, winemaker Oscar Fernandez says in the tasting notes. The result is a medium-body wine with fresh raspberry, cherry and spice flavors wrapped in vanilla and leather with a smooth finish, Fernandez says. El Coto Crianza is a bargain at its full $14 price, but a steal when you find it under $10. If you are a fan of white wine, check out El Coto Blanco for the same price. It’s a wonderful, refreshing wine.